You can add special post processing effects to any overlay. Effect(s) will change overlay image on output (local file or streaming), not ingame. These effects are done completely on GPU and do not affect your CPU load. We plan to add these effects to ingame overlays too in future updates. Select an overlay (1) and click to plus button (2) in Output overlay effects section. Popup menu with a list of available effects will be shown. Click to desired one and it will be added to the end of effects list. If you will click to any effect in effects list, PlayClaw will show you an additional section with effect properties. This effect will help you to remove unwanted color range from overlay image. 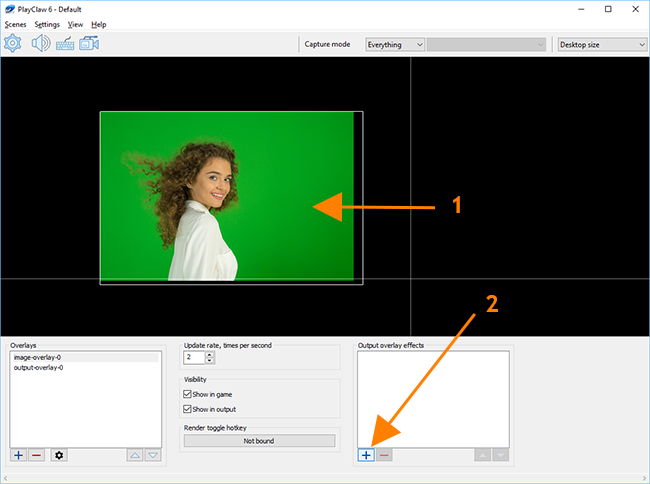 Chroma key (or green screen) effect is mostly used to remove background from a live feed captured from video capture device (like webcam). You need to select a Key color (main color which will be removed). Color spread parameter sets a precision applied for testee pixel. If the pixel color is in this range, then it will be removed completely. Smoothing parameter shows how PlayClaw will process pixels that passed through color spread test. This will help to particially remove pixels that have mixed key and original colors. In most cases these pixels are on edges of objects. More smoothing gives wider range. Smoothing strength sets the "elimination" power that will be applied to mixed pixels. Image mask effect combines an external image with overlay using one of available masking modes. Using this effect you can highlight some overlay areas or hide them. 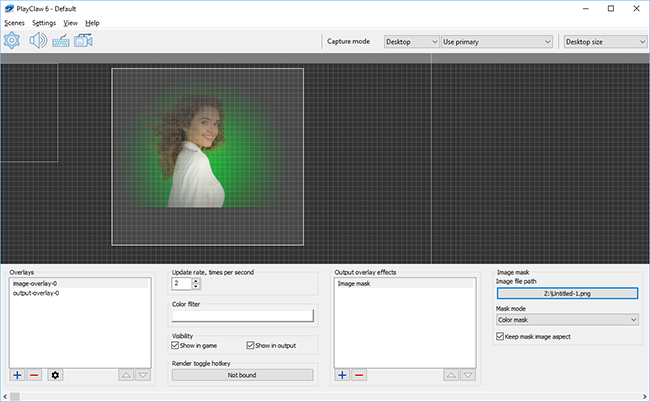 There are 6 modes available: Alpha mask, Color mask, Alpha blend, Color addition, Color multiplication, Color subtraction. Here is a sample how this mask works for Color multiplication mode. PlayClaw simply multiplies overlay color with mask color. 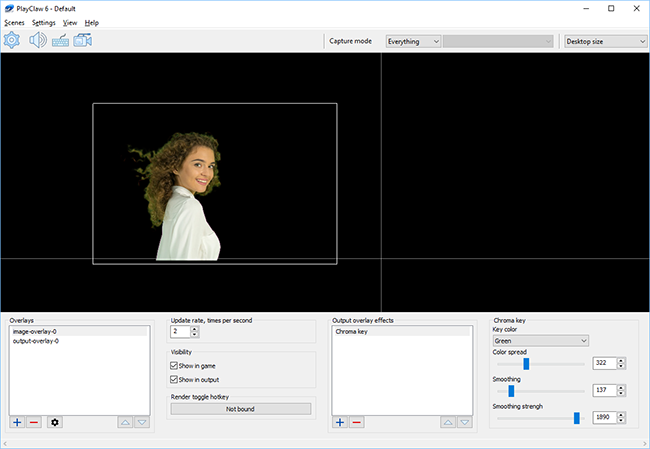 Alpha mask multiplies overlay alpha channel (transparency) with alpha channel of mask image. Color mask multiplies overlay alpha channel with average of mask color.